Here at Official Man Card, we want to clearly define what a Man Card is. Its not a piece of paper. Its definitely not something you print at home and fill out with a pen. Man Card Definition: A Man Card is required proof of manhood in order to become a respected member of the male community. It can and will be temporarily revoked if privileges as a Man are abused. Plain and simple my friends. Its a credit card style, customized Man Card. 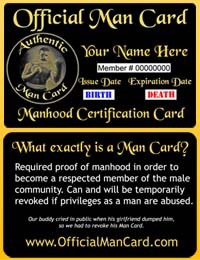 It comes with a Certificate of Authenticity, and Revocation cards to check your friends when they get out of line and unmanly. You can get your Man Card here , at OfficialManCard.com.